Researchers prepare to launch an instrument-laden weather balloon toward Alaska's aurora on April 12, 2012 (at right is a radar facility). If you retrieve one of their fallen balloon payloads, scientists with Project Aether: Aurora will let you keep the GoPro camera — as long as you send in the SD memory card and GPS device. SPACE.com reporter Mike Wall got to tag along with an expedition that studied Alaska's northern lights. Here are his thoughts about the experience. An expedition that's launching weather balloons to the edge of Alaska's northern lights took advantage of a dazzling aurora display early Thursday morning (April 12). SPACE.com reporter Mike Wall accompanied researchers on a snowshoe trek to retrieve a weather balloon that had risen to the very edge of Alaska's northern lights. Team members fill the weather balloon with helium early in the morning of April 11, 2012, most of the way up Alaska's Murphy Dome mountain. Tuesday was a busy and very memorable day. I spent some time with the researchers at their rented house outside of Fairbanks, learning about the project and watching them prepare for a balloon launch that night. Then a few of us drove up nearby Murphy Dome to scout out potential launch sites. We found a suitable open, flat spot, then returned with a couple of balloons around midnight. While the science team prepped their gear, the rest of us gawked at what shaped up to be a spectacular northern lights display. Green light arced above us, then danced in shimmering curtains that held hints of red and yellow. The Project Aether: Aurora team launched their two balloons--one of which carried a SPACE.com T-shirt-- up toward the aurora, and we headed down the mountain, cold, tired and spellbound, around three in the morning. Today should be fun, too, full of dog sledding, snowshoeing and more aurora watching. I'll tell you how it goes! 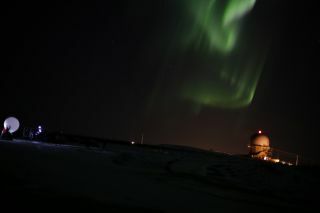 See the northern lights of Alaska through the lens of SPACE.com reporter Mike Wall during Project Aether: Aurora in April 2012. A team of scientists is lofting weather balloons high into Alaska's northern lights displays, getting a unique inside look at this dazzling atmospheric phenomenon.